In this fascinating talk Professor Gill Clarke will discuss The Bishop Otter Art Collection, which comprises a wide range of important twentieth-century British art. Housed at the University of Chichester, this fantastic collection shares many similarities with Swindon’s modern collection, in terms of the way it began and what was acquired. As in Swindon there was very little finance at the outset, and its beginnings relied on people with incredible foresight. As a result they were able to acquire astounding examples of work by Ivon Hitchens, William Gear, Mary Fedden, Paul Nash, Christopher Wood and Graham Sutherland, to name a few. In Chichester’s case, the collection was largely created by two remarkable women; Head of Art Sheila McCririck and the school’s Principal K.M. Elizabeth ‘Betty’ Murray. Despite fierce opposition by staff and Governors, McCririck and Murray created a wonderful and varied collection, purchasing works based on merit rather than the reputation of the maker. From a delicately thrown bottle by Lucie Rie to a charmingly naive boat painting by Alfred Wallis, the collection includes an array of works important to modern British art history. 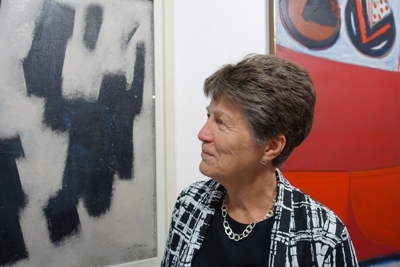 Having recently completed an important catalogue ‘The Bishop Otter Art Collection: A Celebration’, Gill Clarke will discuss the collection’s exciting works and rich history, including the post-war context in which it was began, the philosophy behind it and the challenges it faced. Professor Clarke is Visiting Professor at the University of Chichester and Guest Curator at the University’s Otter Gallery and St Barbe Museum and Art Gallery, Lymington. She has recently worked with Swindon Museum and Art Gallery’s curator Sophie Cummings on a stunning exhibition ‘Women Artists: Power and Presence’.